Race walking / This photo was downloaded from the Facebook page of Manish Singh Rawat and is being used here for representation purpose only. No copyright infringement intended. 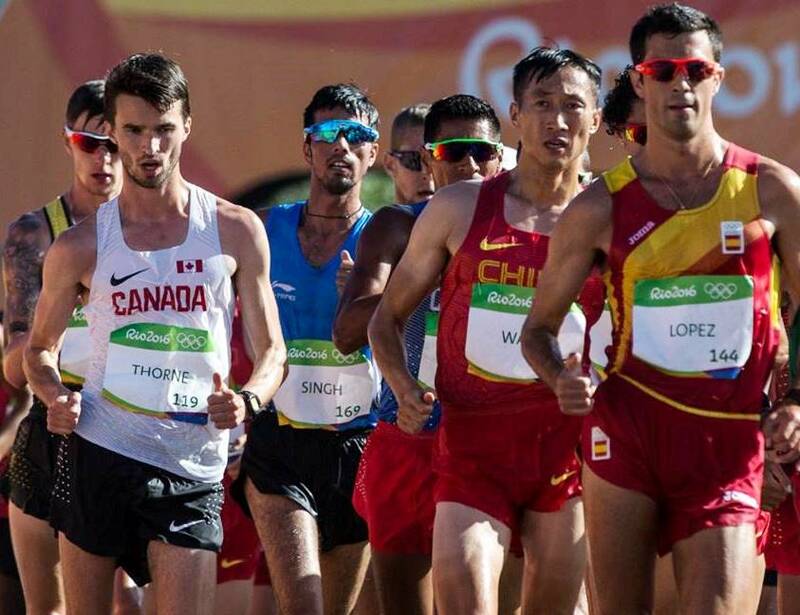 Manish (blue vest) had placed 13th in a field of 74, in the 20km race walk for men at the 2016 Rio Olympic Games. Unlike running, which is the popular face of athletics, race walking lives in the shadows. But it is no less grueling. The timings in the sport would easily resonate with amateur marathoners aware of physical strain. Further, treading the edge of walking and prevented by rules from becoming running, it isn’t easy sustaining the race walk style. The world record in the men’s 50km race walk is 3:32:33; the same for 20km is 1:16:36. Race walking formats may be in for change if the IAAF Council approves recommendations recently placed before it. The Race Walking Committee of the International Association of Athletics Federations (IAAF) has made three major recommendations, which if accepted by the IAAF Council, could witness changes in the format of the sport. According to the IAAF website, the three recommendations agreed to last weekend at a meeting in Monaco include use of RWECS electronic chip insole technology for competitions from 2021, two events each in race walking for men and women at championship programs (women currently have only 20km) to maintain gender equality and reduction of race distance from the currently prevailing 20km and 50km to 10km and 30km. The recommended changes are accompanied by a period of transition. Using RWECS technology will help judges identify athletes who have lost touch with the ground (even as the quest is to move fast, in race walking you are expected to have one foot in touch with the ground always to make sure the sport doesn’t slip into running). It will only be adopted in 2021 provided necessary tests, introduction and distribution of insole chips are concluded by end 2020. As regards ensuring two events each for men and women and reducing the distance for each event, the suggested transition is – move from 20km and 50km for men and 20km for women at the 2020 Tokyo Olympic Games, to 20km and 30km for both men and women at the Oregon 2021 World Athletics Championships to 10km and 30km for both men and women by the 2022 Race Walking Team Championships and continue that format on to the 2023 Budapest World Athletics Championships and the 2024 Paris Olympics (incidentally, the IAAF Council had recommended to the International Olympic Committee (IOC) in December 2018 that a 50km race walk for women be included at the Tokyo Olympics). “ Changes are not always an easy thing, but it is absolutely necessary to make race walking more appealing for fans and for young athletes,’’ the IAAF website quoted its Race Walking Committee chairperson, Maurizio Damilano, as saying in the context of the most recent recommendations. The recommendations will be included in the agenda of the next IAAF Council Meeting, 10-11 March 2019, and if the recommendations of the Committee are approved, the changes will be effective as of 1 January 2021. Meanwhile, according to information on the website of Athletics Federation of India (AFI), India is set to host its first invitational international race walking championships, in Chennai over February 16-17, 2019. It will be alongside the sixth edition of the national open championships in the sport. A report in The Hindu dated end-January said, top national athletes are expected to take part besides second rung walkers from China, Japan, Korea and Australia. Among Indian athletes due at the event were K.T. Irfan, Manish Singh Rawat, Sandeep Kumar, Eknath Sambhaji, Ravina, Soumya Baby and Shanti Kumari. The event in Chennai will be an opportunity for Indian race walkers to qualify for the IAAF World Championships due later this year in Doha, Qatar. Race walking traces its roots to the 17th and 18th centuries; the first competitors were footmen who ran / walked by the side of their masters’ coaches. The aristocracy of the day staked wagers on who would win a race. Some of these were multi-day races. By the 19th century, the sport now popular, was called pedestrianism. Race walking first appeared at the Olympics in 1904 with a half mile race included as part of a 10 event-all around championship, an early forerunner of the decathlon. The men’s 20km-race walk began featuring at the Olympics from 1956 onward. Women’s race walking was introduced at the Olympics in 1992 as a 10km-format; it was increased to 20km in 2000.